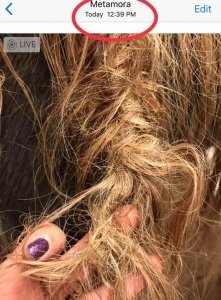 Unlock tangles quickly and prevent tangles and dreadlocks from returning; “Tangle Free Hair” is possible! 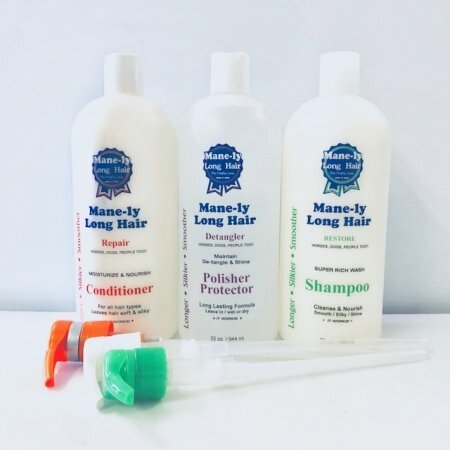 This easy to use Detangler helps maintain Healthy Hair, keeping it Silkier, Smoother with Shine too! 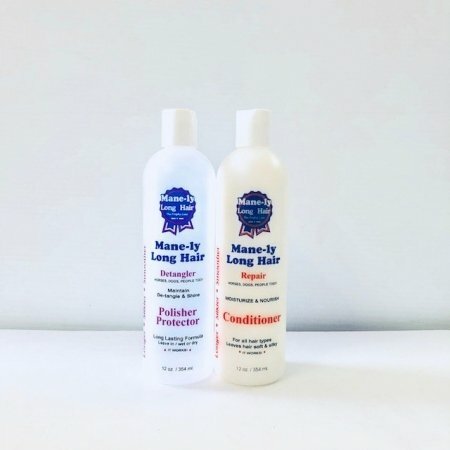 Leave in Long Lasting Formula that strengthens new hair growth while preventing dryness and preventing breakage. An application will protect from the elements for days. Formulated with Keratin Amino Acids, Panthenol B5, layered with water and non water soluble quality silicones(no alcohol, no solvents.) Use year round. 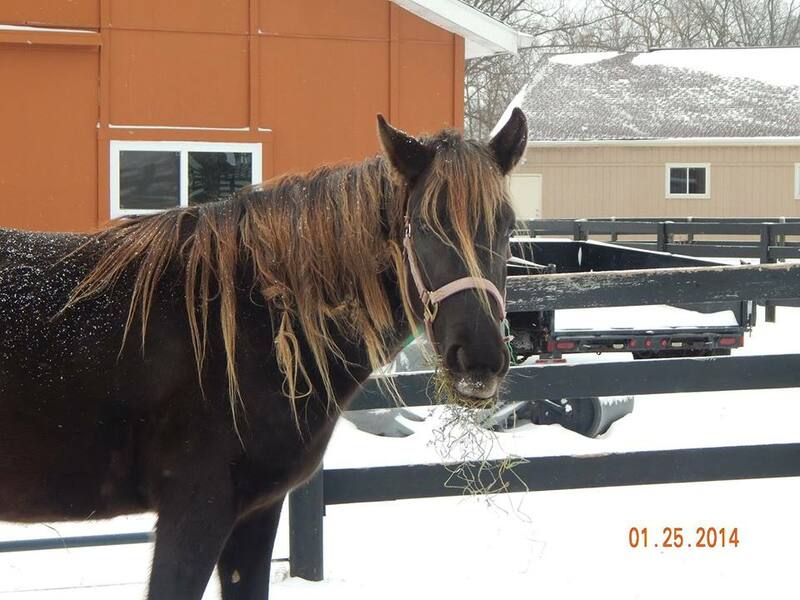 -Formulated for Horses, Dogs and People too! Earn up to 63 Points Points. A Nourishing LONG LASTING FORMULA that is NON GREASY and leaves no residue. Repels dust and dirt, cuts grooming time, keeps hair tangle free, soft and silky. 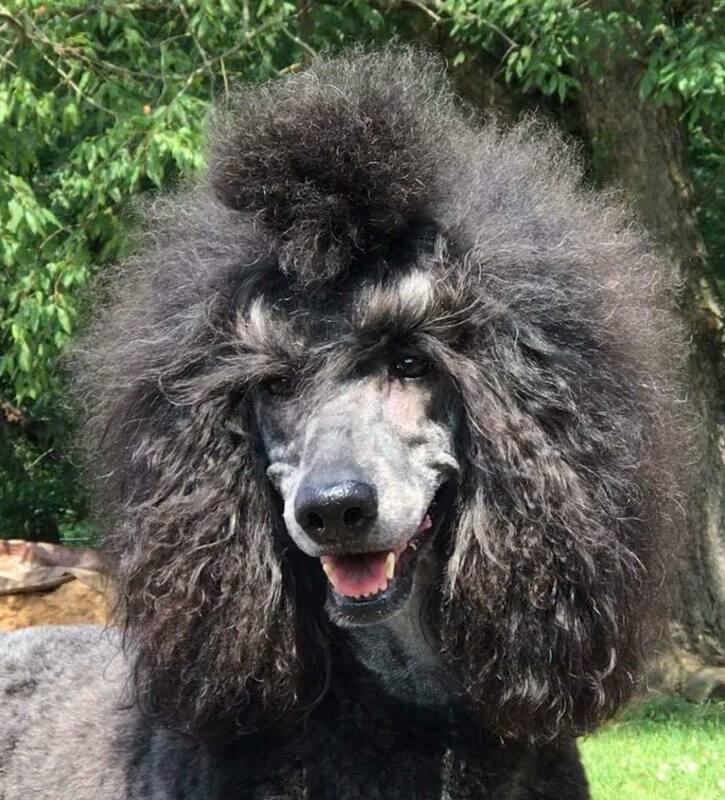 Hair does not need to be washed or cleaned prior to usage. Use all year round. VITAMIN B5 AND KERATIN AMINO ACIDS work to help strengthen and condition all hair types and colors. 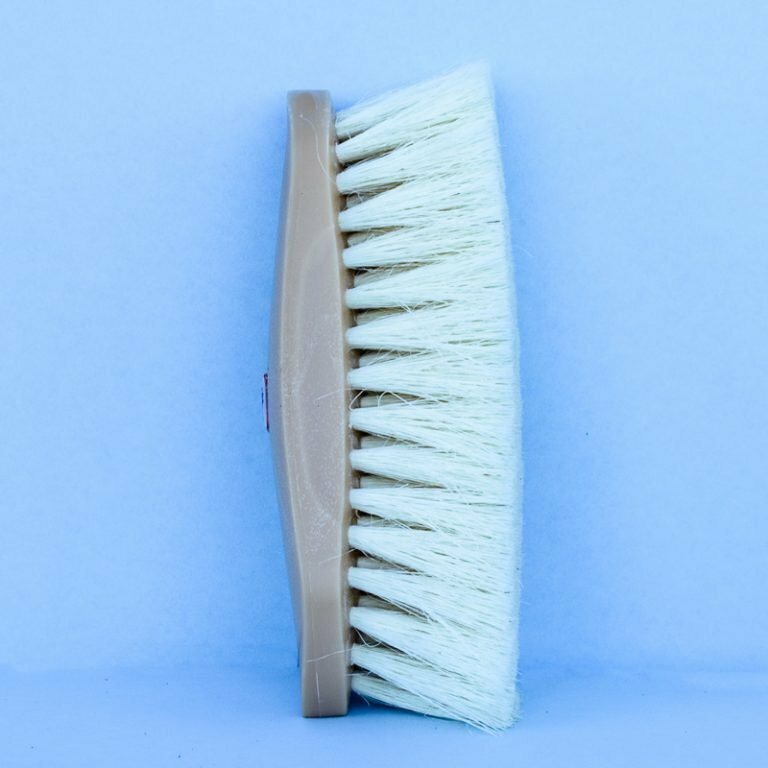 We encourage brushing with our brushes along with the polisher. 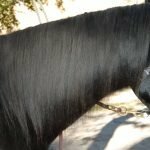 Brushing keeps the horse cleaner and healthier, removing the dirt and dander in the crest of the mane , the Doc of the Tail, the Feather and forelock. 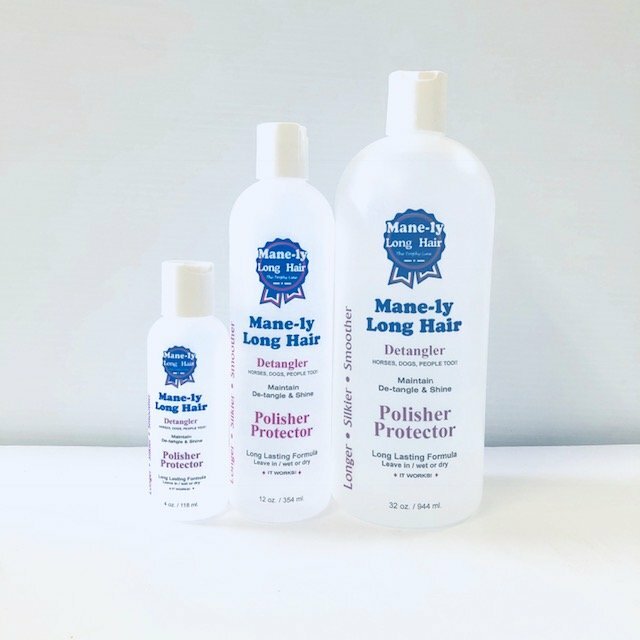 With the correct amount of Polisher in the hair and our brushes it will clean without pulling out or breaking the hair!!! A gentle glide, no yanking or pulling. Remember Polisher is not oily, does not gunk up, no residue, it just wears away or washes out. 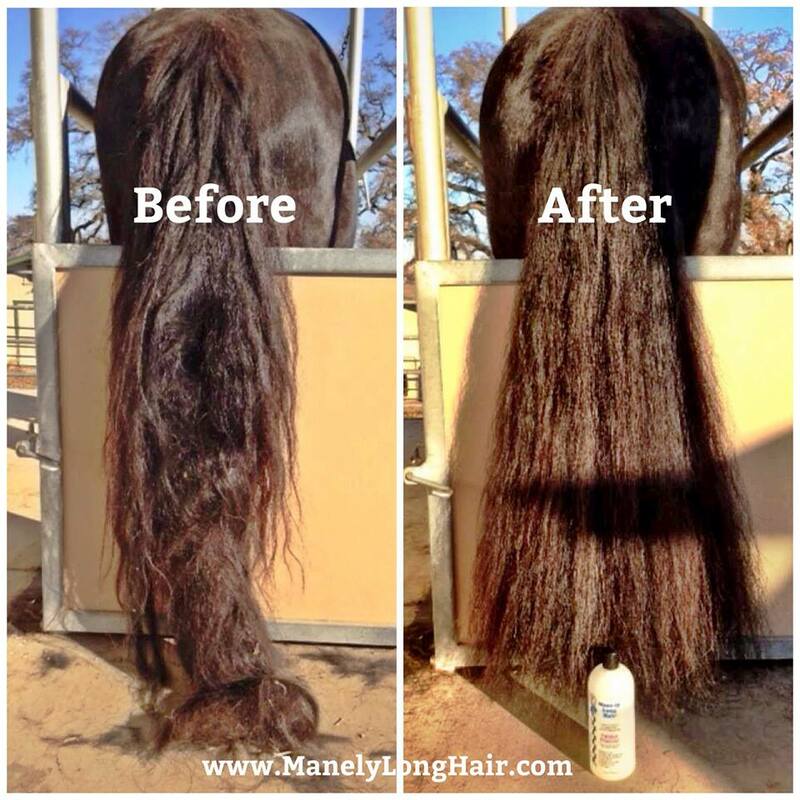 For an average Mane and tail we suggest starting with a big dollop or a dollar coin size in the palms of your hands. Spread evenly starting from the top to the bottom. Take the detangler brush and start at the ends and work upward inch, by inch. If you are struggling at this point with our Detangler Brush, then it means you need to add more polisher! Never struggle and pull hair out! Add a little more until you have achieved the appropriate amount to detangle and brush inch by inch with ease! A 12 oz. 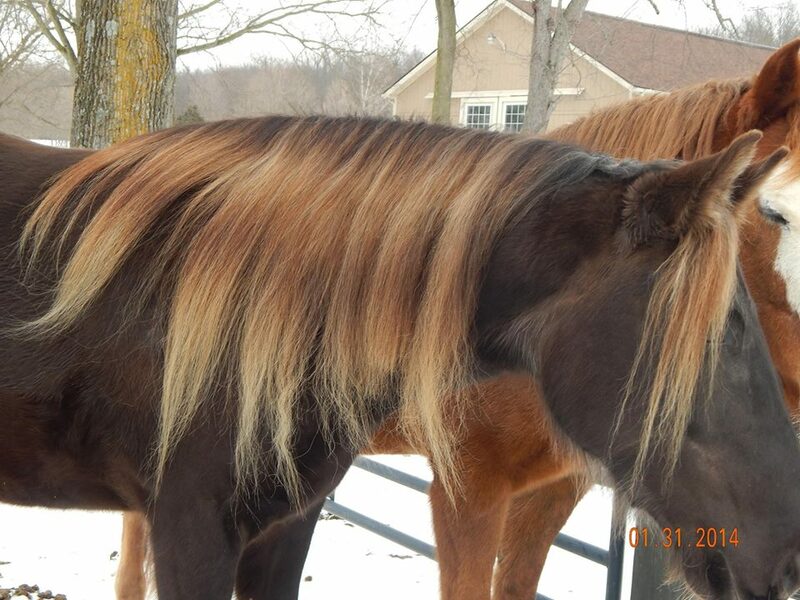 bottle will last approximately 6-9 months with an average mane and tail, used as maintenance aprox. 1 x a week. This shows how less often you need to reapply and how long it lasts in the hair. 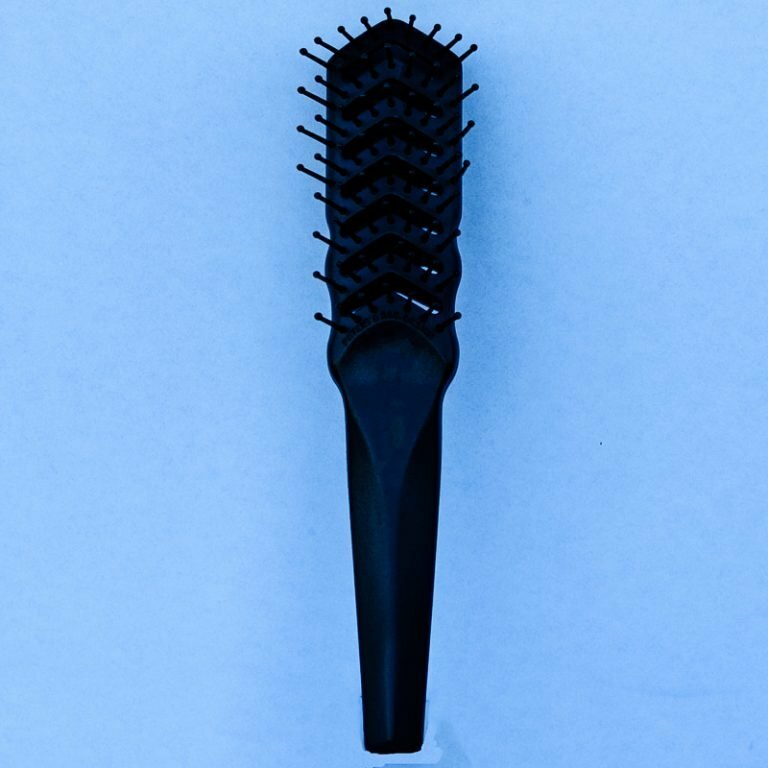 Remember its not just for tangles, a weekly application will PREVENT tangles and burrs from adhering. Stronger Hair, apply a few times a week or a little daily. Layer with Hydrate 24 for extra hydraion, to get the ultimate silkier, smoother, and longer hair. 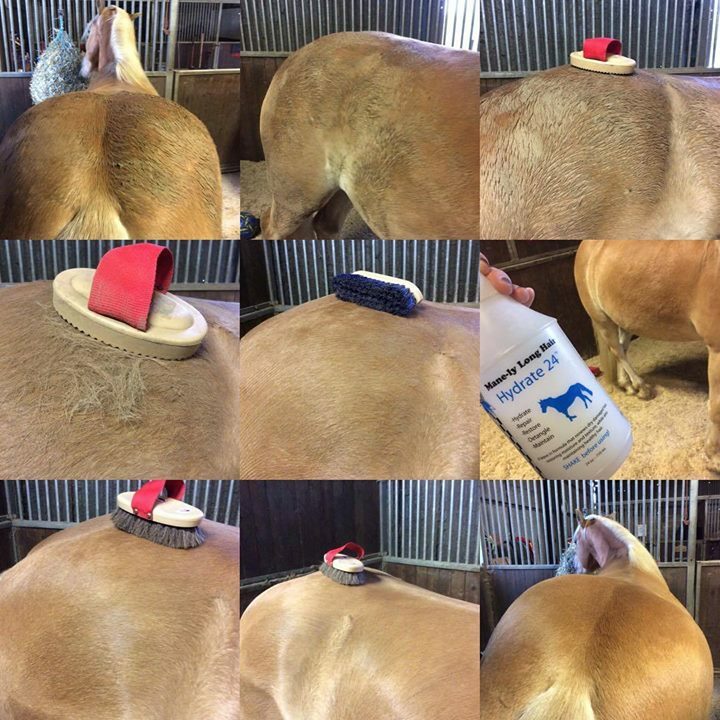 DO NOT USE ON THE HORSES BODY! After using Restore shampoo, our conditioner , towel dry hair then apply a few drops to wet hair, leave in and brush with our detangler brush. Adjust amount according to thickness of hair, and allowing to brush with ease. Leave in hair. Protects the hair from heating elements too! Touch up to dry hair to help with mats and frizzes. After using restore shampoo, our conditioner, towel dry hair then we suggest only a few drops to start. Add more if necessary. Apply to dry or wet coat with hands and distribute through. Apply extra to mats and tangles to remove. Take damp cloth to remove excess, so it is not licked off. Add as needed. Remove matts, burrs etc. Do not leave in, cats lick. Remove with dampened cloth. -Removes tornado tangles and burrs fast. -Maintains show quality hair, leaving it soft , silky and shine. 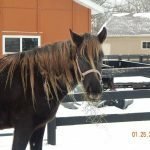 -Does not FREEZE IN THE BARN! Use all year round! Protects from the elements. I bought your product last year and LOVE it! I’m so impressed with how long it last. Put all the other products out there to shame. There is just no comparison. 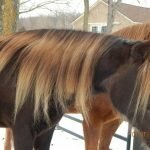 I have 2 gypsy vanner crosses and their mane and tails are so thick. 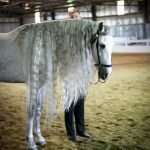 It used to take me over a hour to comb out the tail alone. Not anymore! Unbelievable! LOVE your product! All this shine and softness after ONE small application of your product. Our Blue’s mane looked quite matte and dry, lifeless… Her mane looks BEAUTIFUL after just applying a small amount of your product and brushing it through…. It continues to have a lovely sheen three days later! Also, no icky oily feel! Love it! Will definitely be getting more! 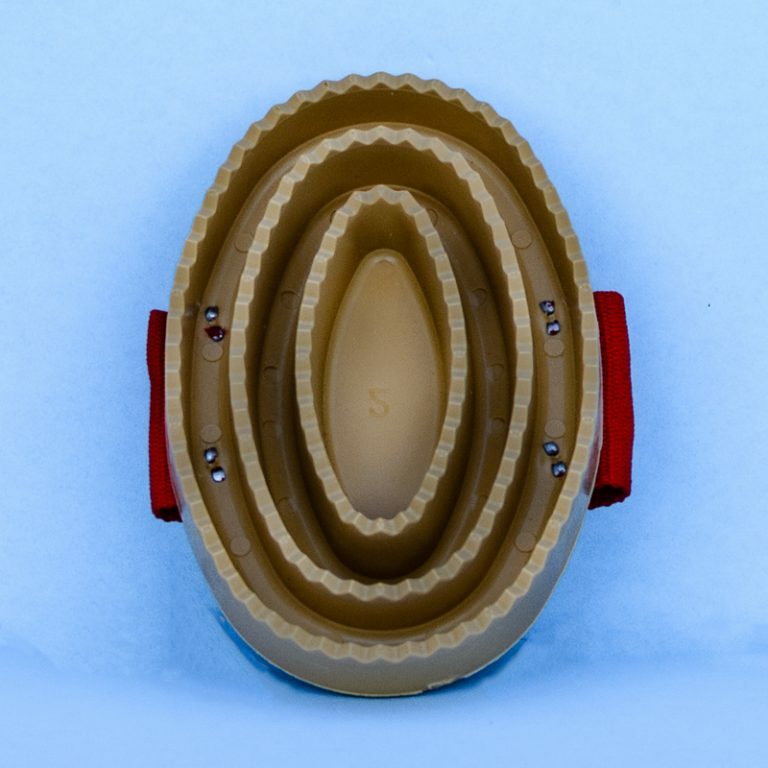 Ok…..so I have to say I am very impressed with this product. There are a lot of products out there that say they will do something and they don’t and this one delivers. 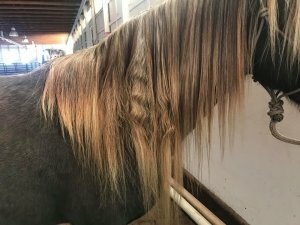 I didn’t get a before picture but my mares hair looked like she had dreadlocks in it. I put Manely Long Hair Polisher Protector in and it took about 15 minutes but it all came out beautifully with out a lot of hair loss. Thank you for such a great ! Theresa Batchelor..THIS PRODUCT IS THE BEST OUT THERE! i was hoping it would work but did not get my hopes up. i saw it at an expo and did not buy it ithought it was expence and wa not sure if iwanted to spend that much money. i kepted thinking about it the day before we moved to OR. I bought the starter kit. i used the product with hydra 24 and polisher. my horse has a really thick tail and i have an old injury to my wrist that can’t handel to much pepetative movment. i love love this product also it smaells really good. 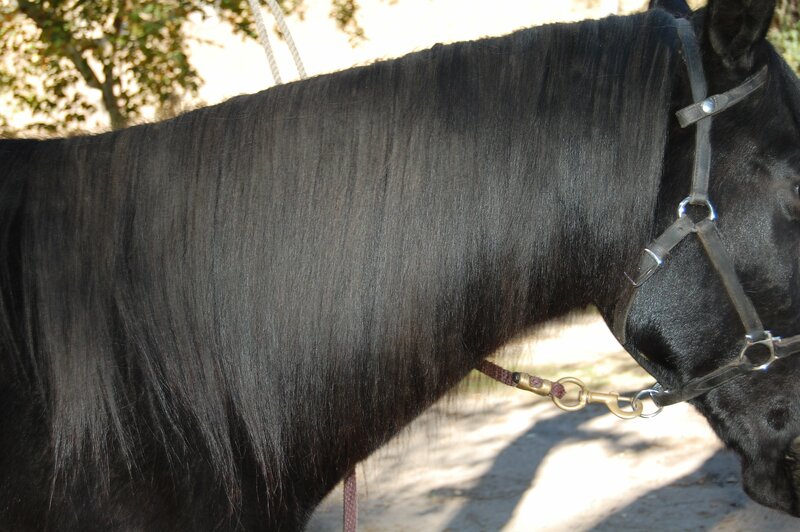 my horse love me to apply to his face and massage it in especally his ears. its a great invesment. you use less of it than a normal product. Thank you for posting! We appreciate your truthful testimonial….enjoy! I was shocked at how well your products work. 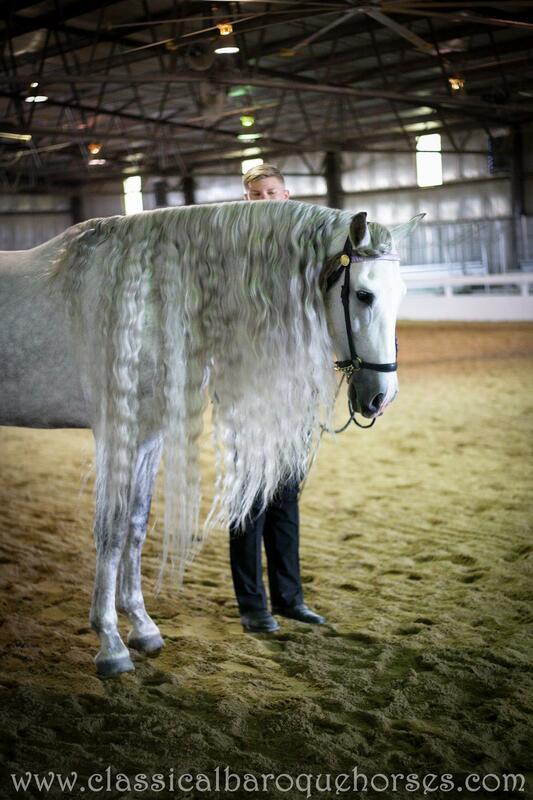 I have an Andalusian cross that has a copious mane and tail. Your products work better than anything I have tried before. There has not been time yet to see if the orange tail disappears but I am confident that it will. 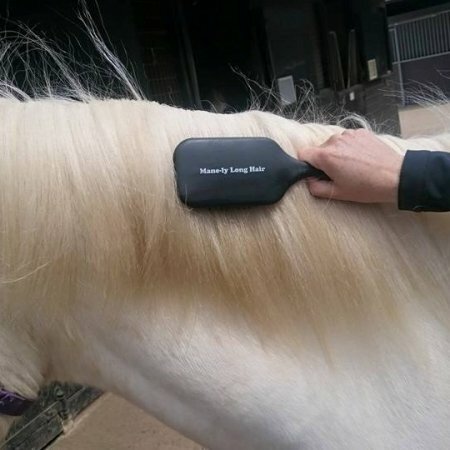 The next test will be to see if he stops rubbing his mane when the weather warms back up. Any pointers for this problem?? 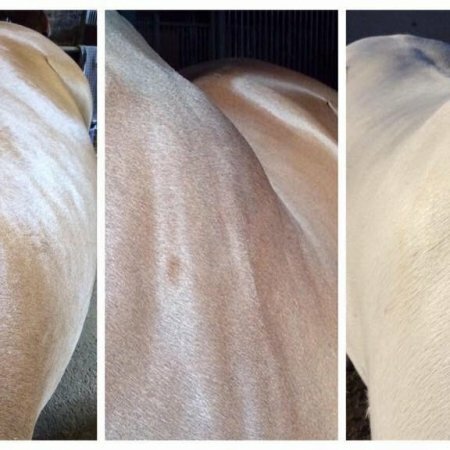 The detangler is the best stuff I’ve used on my horse. 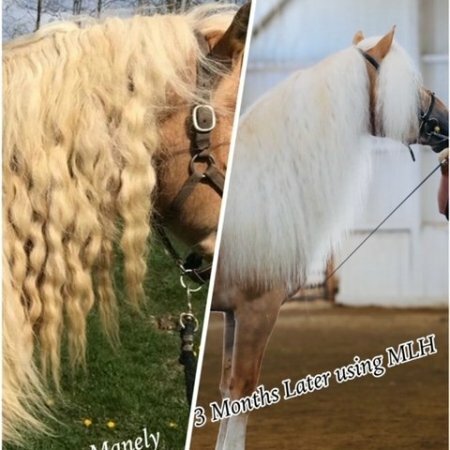 I apply it once every month or so and Duke keeps a radiant, tangle free mane and tail. All you do, subsequent to application, is brush through the hair and the smooth, tangle free luster emerges. 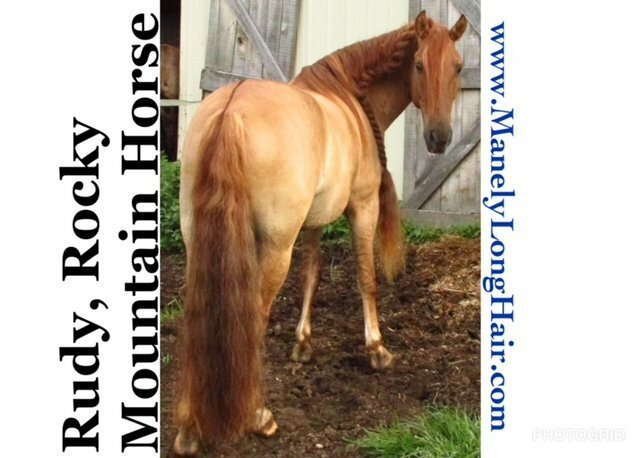 A week or two later……Regardless of weather conditions and amount of “rolling,” brush through the hair and all the highlights return. Great Stuff!! !